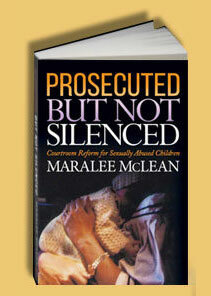 MARALEE MCLEAN is a child advocate, protective parent, domestic violence expert, professional speaker, and author of PROSECUTED BUT NOT SILENCED: Courtroom Reform for Sexually Abused Children. Maralee has written several articles for the ABA Child Law Journal, Women’s E-New and other publications on the problems of family courts not protecting abused children. Maralee is with Women’s Media Center (WMC), SheSourceExpert, NPEIV (National Partnership to End Interpersonal Violence) and is with RAINN speaker bureau, All American Speakers. She presents at conferences, law schools and is a spokesperson for protective mothers. I wanted to make a difference for those working in the fields of domestic violence, child abuse, or child trauma so that such maltreatment would not continue. I wanted to open the eyes of the legal system to mothers “trapped’ in similar situations. I also wanted to make the public aware of the tragedy taking place in our courts and to make a difference in saving other children and protective mothers.